Fondazione Prada, co-chaired by Miuccia Prada and Patrizio Bertelli since 1995, is an institution dedicated to contemporary art and culture. 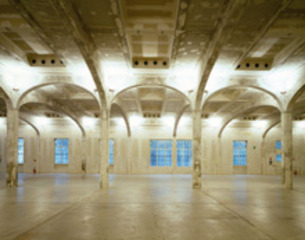 Its cutting-edge exhibitions conceived in dialogue with major contemporary artists like Louise Bourgeois, Walter De Maria, Thomas Demand and John Baldessari, as well as other cultural activities related to cinema, philosophy, and architecture, have enjoyed a wide international consensus. Special international projects included Carsten Höller’s “Double Club” in London, the “Prada Transformer” in Seoul by OMA and Francesco Vezzoli’s “24h Museum” at the Palais d’Iéna in Paris. In 2011 the Fondazione Prada opened a new exhibition space in Venice, Ca’ Corner della Regina, an historic palazzo on the Grand Canal, which is going to be restored over the next years with the goal of offering a stimulating cultural program. A keynote of the architectural program is the Fondazione Prada’s new exhibition space in Milan designed by Rem Koolhaas, to be unveiled in 2015.